Just the twist your keys need! 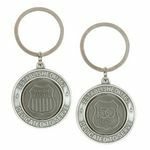 This incredible shiny nickel outside key ring has the wording “Dedicated to Serve” and “Established in 1862” with a pewter inside circle disk, giving your keys a sleek, stylish touch. Engraved with the Union Pacific shield and 150 mark.